Wayne has made no entry in his journal since September 26 when he noted that he had completed 26 combat missions and had a new ship, a B-25J. He also noted that his good friend, Robert Earl Russell, had broken his arm on September 25. This was one of the men with whom he had trained with at Columbia Army Air Base in South Carolina. They had come to the South Pacific together in February along with Harold Dean Finchum, Robert Harland Tolhurst, and Stanley LeVelle Seehorn as a replacement aircrew. They flew combat missions together as a crew, but over the months, the ties established Stateside remained strong. Now, Robert Earl Russell is being evacuated from Sansapor (Mar Air Field) in Dutch New Guinea to a rear area hospital at Finschhafen, Australian New Guinea. Wayne thinks his friend may be sent home. Meanwhile, Wayne’s brother, Verne Richard Gray, is undergoing B-17 combat crew training at the 221st Combat Crew Training School at Alexandria Army Air Base near Alexandria, Louisiana. Their youngest brother, Harry Nordman Gray, is undergoing advanced infantry training at Camp Van Dorn near Centerville, Mississippi. Both expect to be sent overseas at the completion of their training. On October 6, Verne wrote to his stepmother. Today, he responds to a letter from his father. Was sort of surprised to get a letter from you because I expected you were home moving. In my last letter from Ray and Jean1, they mentioned that grandma had gone to Collins to help ethical move so I imagine she found a place O.K. There are various rumors that we shall receive a furlough before we leave for overseas but to us it is a little doubtful. If it turns out so I’ll let you know of it as soon as possible. If I have any chance at all I hope to get down to Camp Van Dorn and see Nord once more before going overseas. By the way dad, I received my corporal stripes the first of this month. They are really shoving this flying down our throats. For the next seven days we are scheduled to fly six days. Yesterday we dropped 20 bombs, one at a time. We were up for over seven hours and almost froze to death. We hadn’t expected it to be so cold and never took our Teddy Bear clothing along. Do you have any ideas on how we can get money from the government under the G.I. Bill of Rights6 and what sort of a business we could get into that would be a success? I sent for the correspondence courses on elementary electricity. That is the beginning course. After I finish it there are three other courses on the practical use of it. I feel that they should give me a groundwork for the last ones which cover electrical drawings and diagrams into courses in electrical engineering. I know this sounds like a lot but I feel they will go fast since we will have plenty of time for study. My mind is made up that the electrical trade is the one I want to follow and I feel that the more education I can get on the subject the more chances I’ll have to get a job over other applicants. I know you are doing your part by working on that job dad so keep on doing your best and it would help us all in the end. The government took the Navigation watch back that was issued us at Yuma. Time passes so fast I really don’t need a watch but even at that I still miss having one. As soon as I get enough money ahead I’ll get a new case for my graduation watch and then will be able to use it once more. As soon as Ethel sends her new address to you please send it on. We brief at 6 p.m. for tonight’s flight dad so will have to close for now. 1 His uncle, Raymond Claire Gray. 2 Apparently, Verne’s father asked him if he could secure a pair of G.I. pants, probably khakis, for him. The military had strict rules regarding the diversion of supplies to civilians. 3 Verne could take his meals on the base for free, but his wife and son had to “live on the economy” paying for both food and lodging. French toast, bologna and toasted cheese sandwiches along with hamburger gravy on bread stretched money a long way. 4 A birthday card sent him eight days later on October 17 was addressed “Thomas J. Gray, c/o General Delivery, Hanford, Washington.” He would soon celebrate his 50th birthday. Years later, it would be revealed that Thomas Jason Gray was involved with the construction of power generating facilities and the installation of electrical transmission lines at the Hanford Works as it was then called. Established in 1943 as part of the Manhattan Project in the town of Hanford in south-central Washington, the site was home to the B Reactor, the first full-scale plutonium production reactor in the world. Plutonium manufactured at the site was used in the first nuclear bomb, tested at the Trinity site, and in Fat Man, the bomb detonated over Nagasaki, Japan. 5 Some B-17 units were engaged in anti-submarine patrols along the coasts of the Continental United States. 6 Verne is thinking of life after the war. The Servicemen’s Readjustment Act of 1944 (P.L. 78-346, 58 Stat. 284m), known informally as the G.I. Bill, was a law that provided a range of benefits for returning World War II veterans (commonly referred to as G.I.s). Benefits included low-cost mortgages, low-interest loans to start a business, cash payments of tuition and living expenses to attend university, high school or vocational education, as well as one year of unemployment compensation. It was available to every veteran who had been on active duty during the war years for at least ninety days and had not been dishonorably discharged; combat was not required. 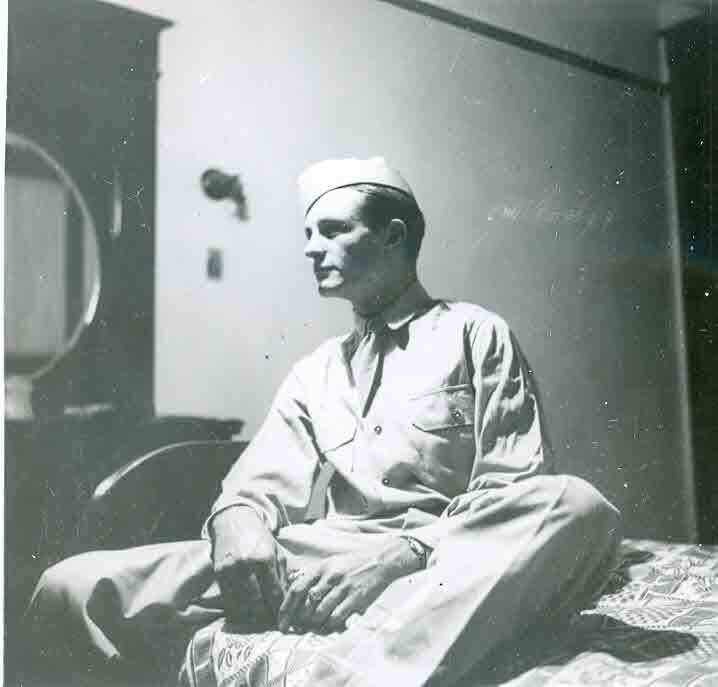 7 Verne hitchhiked to Shreveport from Alexandria to visit with his brother. They will never again see each other. See: https://waynes-journal.com/2014/09/23/september-24-1944/. 8 While stationed on Banika Island, Wayne sent Verne a money order for $25.00 on July 19, 1944. See: https://waynes-journal.com/2014/07/18/july-19-1944/. This entry was posted in Uncategorized and tagged 221st Combat Crew Training School, Alexandria Louisiana, Australian New Guinea, B-25J, Camp Van Dorn, Centerville Mississippi, Dutch New Guinea, Finschafen, G.I. Bill, Hanford, Harland Robert Tolhurst, Harold Dean Fincham, Manhatten Project, Nagasaki, plutonium, Raymond Claire Gray, Robert Earl Russell, Shreveport, Stanley LeVelle Seehorn, Thomas Jason Gray. Bookmark the permalink. Teddy Bear clothing? That’s a new one (at least for me). Do you know much about that term? Wasn’t it another nickname for the lined sheepskin flight jackets. Its was designed after Teddy Roosevelt? For a quick review of Teddy Roosevelt’s relationship to the “Teddy Bear”, check out http://en.wikipedia.org/wiki/Teddy_bear. The story is more than most might have ever imagined. I take it Verne was your father? Neat stuff. It is possible that my wife’s dad, Bill Nicklason, knew Thomas Gray. Bill was at Oak Ridge and then at Hanford very early. I think I told you about him before. Bill was from DuPont, WA and continued his career with DuPont, which was the prime contractor on the Hanford Project. I spoke to him a number of times about Reactor B, which he worked on from the very beginning. 1943? He told me he saw it when nothing was there. Bill retired in late 1970s. He passed away a year ago last week at 98, a few weeks shy of his 99th birthday. Meg and I went down to DuPont last week to visit his grave. Fascinating. A real insight into the climate during WWII. The optimism of post war life was fascinating. I was able to speak to a B-17 crewman a few years back and nothing he told me was pleasant. Not at all. Could you enlighten us about the phrase “Teddy Bear clothing?” Haven’t seen that one before. The closest reference to “teddy bear clothing” that I could find comes from Goronwy Edwards book Flying to Norway, Grounded in Burma: A Hudson Pilot in World War II. On page 11, the following appears: “Despite dressing like Teddy bears in our layers of flying clothing, nothing could keep out the cold . . . “ My guess is that after they put on the layers of flight clothing they looked like stuffed bears. They needed those extra clothes. The average high temperature in Alexandria, Louisiana in October 1944 was 80.9 degrees. [climateSpy.com (http://www.climatespy.com/climate/summary/united-states/louisiana/esler-rgnl/october/1944).] Given an adiabatic lapse rate of roughly 2.5 degrees per 1,000 feet of altitude, the crew would have found a temperature of 56 degrees at 10,000 feet and 31 degrees at 20,000 feet. [“Lapse rate” Wikipedia (http://en.wikipedia.org/wiki/Lapse_rate).] Quite a change from that on the ground and their “teddy bear” clothes would have been sorely missed. A fascinating Insight. Be interested to know, Were there preferences between the B-17 and B-25? Was one preferred over the other? I don’t think it is a matter of preference. The B-25 was a medium bomber and the B-17 was a heavy bomber. They flew different mission profiles. Both would have been uncomfortable in one way or another on a long mission. Very true. Both had advantages and disadvantages, both uncomfortable on long missions but very different in their mission profile. I wasn’t sure if crews perhaps trained in smaller bombers and then moved to larger depending upon their postings or whether they trained in heavy / medium / light and remained there. Maybe some might have preferred a medium bomber due to its agility / speed or a heavy for its protection or status. A good point anyway. Preferment implies choice and knowledge. As far as I am aware, aircrew were assigned to specialty schools, then to combat crew training on a particular aircraft type and then to a unit which flew that type of aircraft. No knowledge and no choice. Pilots, on the other hand, would be an exception. They would have flown various types of aircraft as they qualified for different ratings; hence they would have knowledge of the different aircraft. Being officers, perhaps they would have some modicum of choice when it came to unit assignments. In the end, though, it was war. People went where they were sent..